Verona is our little pocket rocket, sired by our male Ruger and is a great-grand-daughter of our foundation female Nestle. She is a fantastic example of a dog that truly believes that work = play = work. She just loves to train and is probably the smartest dog I have ever trained. She is very food and toy motivated and can be taught any new task in just minutes. Verona shows much talent as a hunting dog but it is her destiny to be an incredible agility dog – she is ridiculously fast, very light on her feet, and has a lovely short stride that allows her to turn and accel/decel quickly. She also has the most incredible ability to save a run from a late or unclear cue by masterfully jumping at impossible angles to keep bars up. Verona was the winner of the 2013 Eromit Cup. Her athleticism is second to no dog I have ever met. 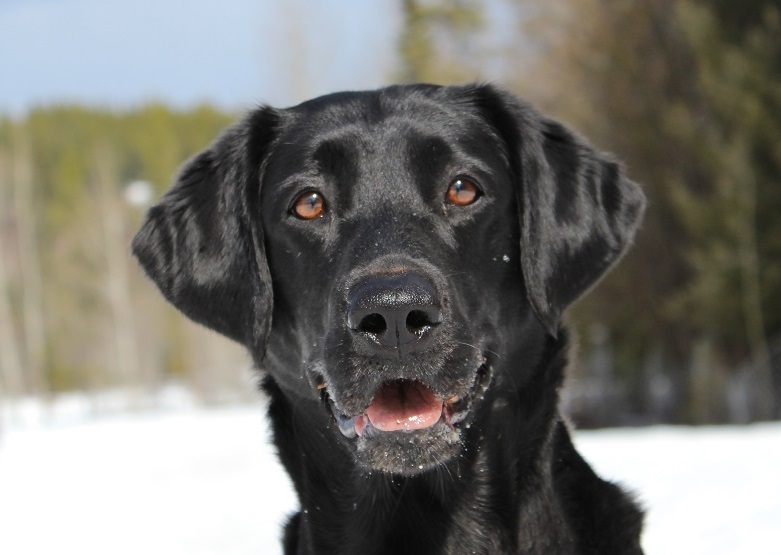 She spends winters enjoying her role as ‘lead dog’ on our Labrador sled dog team. She has a very happy, outgoing nature and has a sixth sense about playing gently with youngsters – humans and puppies – and she is often a favorite of visitors to our home. When she’s not busy entertaining the other dogs or showing off her talents, Verona is quite content to just hang out and relax with her family. Her siblings are versatile as well, competing in hunt tests, field trials, agility, flyball and dock diving. Verona’s offspring have earned titles or awards in hunt tests, field trials, flyball, agility, rally, and dock diving, and are validated in search and rescue. Verona is now retired from breeding but will continue her competition career. Her blood lives on in her daughters Viper and Vanilla and grand-daughter Avi.